Charities are a valuable and important part of our society. However noble the cause, each charity must be properly formed prior to operating. This takes time and planning. Charities operating without the proper registrations and licensure may be subject to penalties and closure. The first step to starting a charity is to create the business entity. This involves forming a nonprofit trust, association, or corporation with the Secretary of State (or equivalent state agency). This may include creating and appointing a board of directors. The entity must be formed using specific language regarding the nonprofit’s charitable purpose in order to be eligible for federal tax exemption. Next you must obtain an EIN (employer identification number) for the entity from the Internal Revenue Service (IRS). This number will be used for identification purposes during the federal tax exemption process and the life of the charity. Make sure when applying for the EIN the option “church or church controlled organization or other nonprofit organization” is selected as the type of entity. The most common type of federal tax exemption awarded to charities is the 501(c)3 tax exemption. In order to be eligible, the nonprofit must have an exempt purpose that is recognized by the IRS. The application, which must be filed with the IRS, requires detailed information about the charity’s ownership, board of directors, purpose, and financials. The IRS will review the application for approximately three months prior to making a decision and issuing the exemption. Each state has different laws and licenses required for charities to operate in that state. Currently, forty states require charitable solicitation registration and many have adopted the Model Act Concerning the Solicitation of Funds for Charitable Purposes. The general rule is that a non-profit conducting charitable solicitation within the borders of a state must register before soliciting funds from residents of that state. The registration process includes application fees, supporting documents, renewal deadlines, and annual financial reports requirements. The organization must often provide a copy of their 990 tax return. Although many states utilize the uniform registration statement, each jurisdiction is slightly different. Sometimes the charity must also register the business entity with the Secretary of State. If the charity will be operating or have a physical location in a city or town, they may be subject to local business license requirements. Some states offer sales tax exemption to certain types of charities and nonprofits. In order to qualify, the charity may have to register with the state department of taxation or revenue. Charities can use sales tax exemption certificates to purchase goods and services necessary to the organizations function. 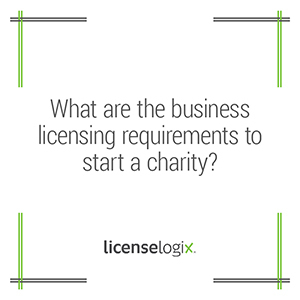 LicenseLogix will help guide charities through the entire licensing process. We can help you obtain all of the licenses and registrations you need, minimizing time-consuming and costly delays. For additional help you can fill in the form on the bottom or give us a call at (800) 292-0909.